Remember – don’t get your MacBook wet! Water and electronics don’t mix – I’ve talked about it before but I want to discuss a few points again. Is your MacBook waterproof? Not a chance. My guess is that some of these customers don’t even know that they had a liquid spill or had any contact with water/soda/coffee whatsoever. Sometimes is the unknowing fault of a child or household pet that inadvertently spills or “leaks” onto a keyboard. Now THIS is a bad MacBook Pro battery! We’ve been receiving an unprecedented amount of blog reads in this first month of 2016, thank you and I really appreciate it. I visited my Mission Store yesterday and was helping solve a few problem when I came across this unit that needed to be removed from the premises immediately. Not only is an exploding battery like this just terrible for the computer (it needs further repairs now too!) but if the gasses from this battery leaked out and into our tech lab it would be smelling and toxic. This is one that need to get to the recycling depot asap. We don’t want to cause a fire or make anyone sick at the office that’s for sure! The computer stops taking a charge or won’t run off of battery power. The trackpad on your computer stops clicking. The spacebar or the “lower” keys feel different when you depress them. 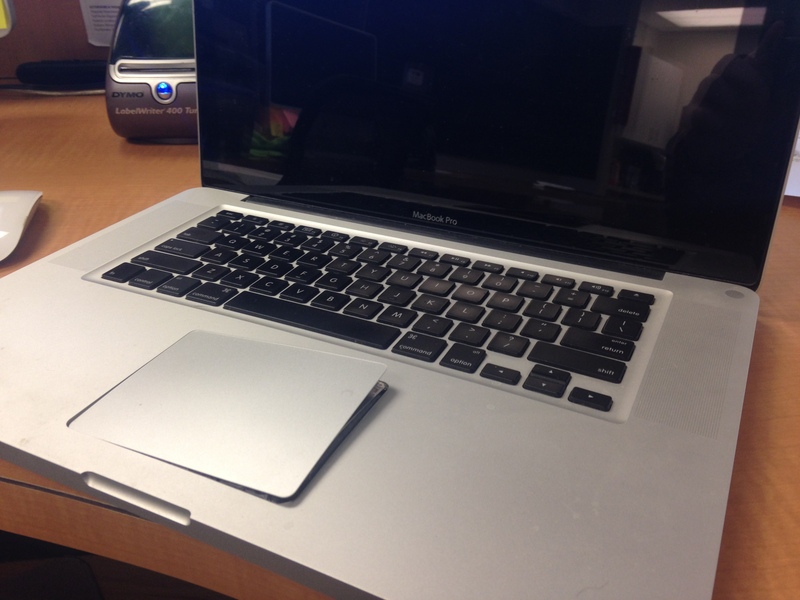 Your trackpad pops out of the case, from the bottom up. The Apple software will also tell you when your battery should be replaced, and it’s a good idea to follow through with that advice and have your battery replaced. I mean, it is a portable computer so you’re going to want the battery to be as good as possible, right? Right!! 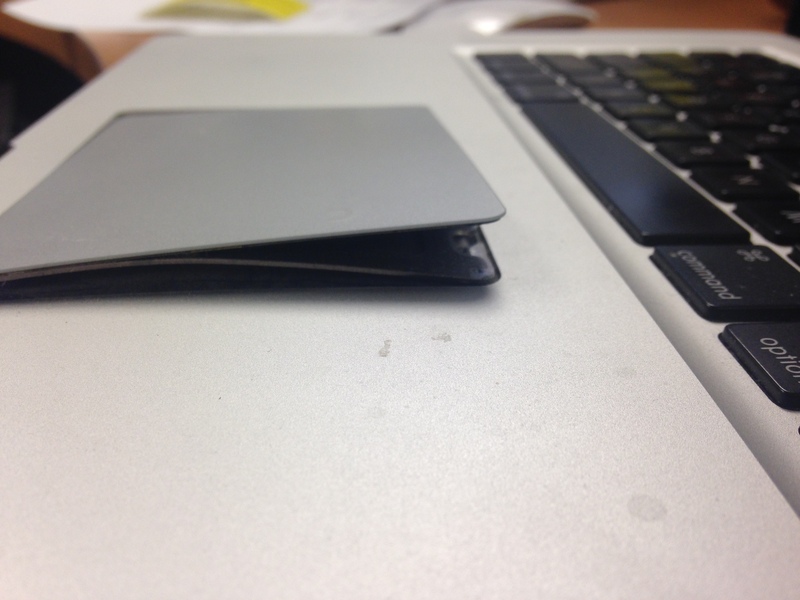 MacBook Pro Unibody – known problem. The MacBook Pro Unibody laptops that don’t have a “user replaceable battery” (there is a version that a customer can easily repair the battery themselves) – have a problem that you might want to know about. After a few years of use, the battery can tend to have issues; but sometimes the symptom starts as a failing trackpad…let me explain. When one of these batteries fails, it can “puff up”. Although I’ll be talking primarily about Mac laptops in this post, swollen batteries can be found in many devices that use lithium batteries, including Smartphones. There’s also no single cause for a swollen battery. Some are due to manufacturing defects, others are caused by the age of the battery, and still other cases can be caused by misuse, such as not properly exercising the battery over time, or by using the wrong power charger. In general, a swollen battery occurs when the battery’s cells are overcharged. This can lead to warping of your case, and pressure under your trackpad that can cause it to stop clicking or even pop up and out of the palmrest. Just check your battery meter in the top tool bar on your Mac. If it ever warns you to “replace battery soon”, then run (don’t walk!) to your nearest Mission Repair for replacement. We can take care of you fast, and save you potentially costly repairs before the battery pops. Macbook Pro swollen battery – it’s not a myth! Hello again and good morning! The customer’s computer was bulging and you can see the trackpad popping up off of the palmrest. What caused this catastrophe? It was a BAD BATTERY that shorted out, “bulged” and basically bent this computer out of shape. Unfortunately, there were a few parts that we needed to replace on this unit to get it back to normal working shape; but it’s not a problem for Mission Repair. The question is “how could have the customer avoided this?”. That’s a tough one to answer; because there isn’t much that could be done. These things can just happen from time to time. I know that’s not a great answer; but it’s the nature of batteries unfortunately. The only advice that I can give is to periodically replace the battery in your computer on a routine basis – before a disaster happens. If you do have a “meltdown”, give us a call!